Go To The Gravel stands at Abraham's Equine Center, near Cedar Rapids, Iowa. CEDAR RAPIDS, IA—MARCH 20, 2019—Abraham's Equine Center, near Cedar Rapids, Iowa announced today they will offer a $500 "Spring Special" fee for their stallion Go To The Gravel, a half-brother to world champion and leading sire One Dashing Eagle and a half-brother to Grade 1 winner and leading sire One Sweet Jess. A $120,000 Heritage Place Yearling Sale graduate in 2014, Go To The Gravel is owned by Corrine Bockenstedt and Charles Abraham, DVM. He is one of the first sons of the leading young sire Favorite Cartel to be offered at stud in the US. 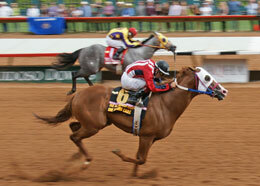 World champion One Dashing Eagle winning the 2012 $2.4 million All American Futurity(G1) at Ruidoso Downs. From only five crops to race, Grade 1 winner Favorite Cartel ($607,559) is the sire of 17% stakes horses, nearly $9 million earners with more than $25,000 average earnings per starter. Go To The Gravel is out of the "Blue Hen" champion producing and stakes winning First Down Dash mare One Sweet Dash SI 93 ($81,973). She is the dam of 16 ROM, 11 winners, 6 black type from 17 foals to race including AQHA Racing World Champion One Dashing Eagle SI 98 (6 wins in 7 starts, $2,080,065), Golden State Futurity(G1) winner One Sweet Jess SI 103 ($953,592), stakes winner Hes A Standout SI 101 ($45,402), G3-placed Jess A Sweetie SI 97 ($71,948), stakes-placed One For The Brothers SI 94 ($12,133 to 3, 2018), stakes-placed One Favorite Sweet SI 90 (2nd Ruidoso Juvenile at 2, $23,228). 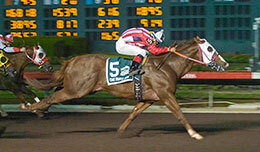 One Sweet Jess winning the 2010 $1,230,450 Golden State Million Futurity(G1) at Los Alamitos Race Course. The second dam is the G3-placed *Beduino mare Sweet Beduino SI 101, a half-sister G3 winner Sweeten The Pot SI 113 ($123,132), stakes winner Dash For Game SI 106 ($15,310), and stakes-placed Horseshoe Bend SI 110 ($32,084) and Easy Dashing Chick SI 88($29,512). She is the dam of 15 ROM, 13 winners, 7 black type including G2 winner A Dash Of Beduino SI 101 ($103,943), G3 winner This Jet Is Royal SI 107 ($91,613), G3 winner One Sweet Dash SI 93 (see above), stakes winner Posting The Colors SI 106 ($36,776), stakes winner Fly With Honor SI 108($16,305), etc. Sweet Beduino is the granddam or great-graddam of stakes horses G1-finalist Joy Roses Eagle SI 86 (3 wins at 2, $174,803), stakes winner Mesa Marvel Si 103 ($133,290), TQHA Sires' Cup Stakes winner Dale N James SI 107 ($107,429), stakes winner Agouti Traffic SI 91 ($23,918), stakes-placed Traffic Ryon SI 103 ($40,220), etc. 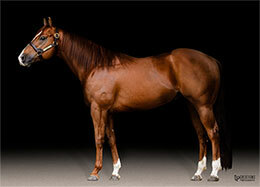 Go To The Gravel hails from one of the leading female sire lines in the Quarter Horse racing industry. His dam is a full sister to leading sire Walk Thru Fire, sire of 71 stakes winners, 8 champions with earnings of more than $36 million. Probably one of the best bloodlines ever available to the Iowa-bred program, Go To The Gravel's first foals are yearlings of 2019. His foals are eligible for the Iowa Stallion Futurity and Derby, Minnesota Stallion Breeders Futurity, Indiana Stallion Futurity and Derby, Nebraska Stallion Auction, TQHA Sire's Cup program and more. For additional information or breeding contracts call Dr. Charles Abraham at (319) 366-6441.